It looks like a Lagoon. It’s built like a Lagoon. But this 39-footer is a new breed of catamaran. It looks like a Lagoon. It’s built like a Lagoon. 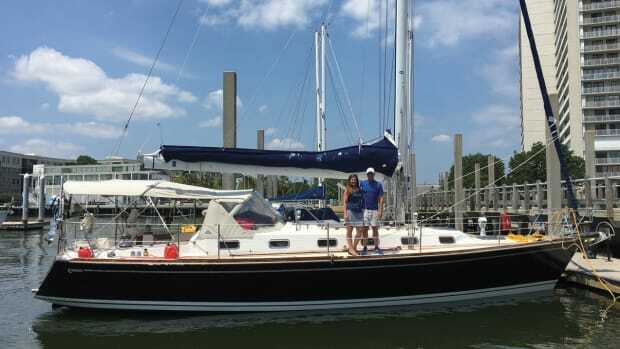 But this 39-footer is a new breed of catamaran. 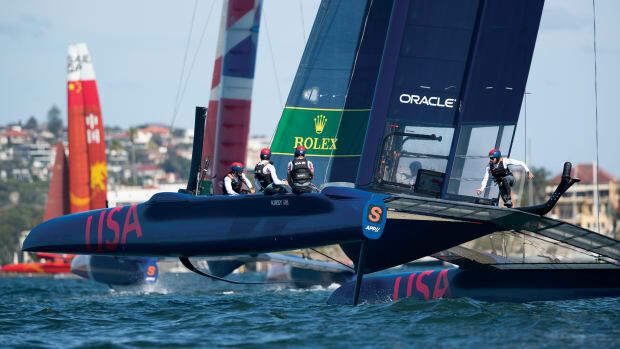 Specifically, although naval architects Marc Van Peteghem and Vincent Lauriot Prévost of VPLP Design have kept the signature vertical windows and overall appearance of previous Lagoon models, they made significant changes to the rig and hulls to improve sailing performance. Most importantly, the mast and center of buoyancy of the hulls are now much farther aft. The bows are also very fine and plumb to maximize waterline length. Moving the center of buoyancy in a boat changes everything, including the structure needed to support the loads. Normally, the mast on a cat is stepped over the main bulkhead at the forward end of the house. But because there is no bulkhead under the mast on the 39, Lagoon had to install an unobtrusive compression post at the edge of a galley counter, which is supported, in turn, by a husky bridgedeck, comprising a strong composite beam with stringers that transfer rig loads to the hulls. This grid is also tied into the fore and aft bulkheads, making for a square, stiff structure that held up well during what proved to be a pretty rough test sail. The fiberglass layup schedule is rather conventional for a modern boat, with vacuum-infused balsa core above the waterline and solid glass below. The deck is also balsa cored. As with other boats from this builder, the plumbing and wiring are first-class, with everything labeled, bundled and properly clamped. I appreciated the easy access to the electrical and water systems and to the twin engines. Years of charter trade experience show in the Lagoon’s deck layout, which has lots of grab points, wide side decks and good toerails. The foredeck is mostly netting, which reduces weight and slamming in rough water. A central longitudinal beam carries the anchor chain out to a point between the bows—a fairly conventional setup. Two large, deep lockers in the foredeck hold fenders and lines. One criticism: reaching the cabintop from the foredeck is not easy. A step or two would be welcome here. The cockpit is large, comfortable and uncluttered by sheets or halyards, as all lines are up on the cabintop. Traffic flow between the cockpit and saloon is excellent, and there’s enough seating for a sizable party under the targa top. A few steps up on the starboard side and you’re at the helm, which is in a cutout space in the targa top. I have a knack for finding any head-knocking overhangs on a boat, and the 39 has none. Thank you, Lagoon! One benefit of having the mast aft is that all halyards and sheets fall conveniently to hand at the helm station. This simplifies line runs, reduces friction and gets the running rigging out of the way of the crew and passengers. A line tail bag beside the wheel completes the setup. I really liked this helm station, although a bit of shade overhead to protect whoever is at the helm from the tropical sun would be welcome. The interior is light and bright, thanks to a stylish blend of fabrics and blond Alpi wood laminate joinery. The big vertical windows—I really can’t call them “ports”—provide a panoramic view and are low enough to look through when seated. 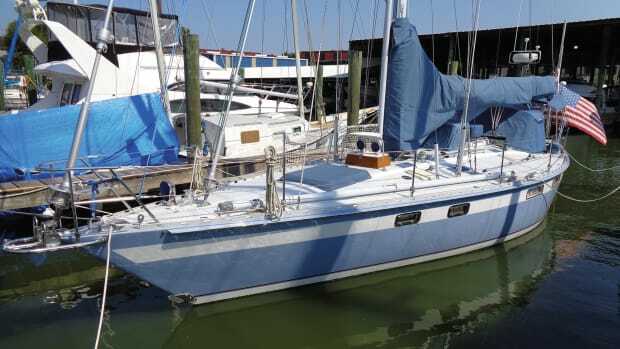 Tall sailors will delight in the headroom, and all will appreciate the countertop fiddles and mid-cabin post that make good grab points in rough weather. The galley is to port, with the nav station ahead of it. The big dinette table will seat five easily. There’s space at the nav station for whatever electronics you choose to install, and the view will permit sailing from inside with an autopilot in inclement weather. The nav desk can hold a standard chart book. Access to the private quarters a few steps down in the hulls is through sliding doors in the saloon. I sailed the owner’s version, which has a big double berth aft in each hull, plus a nice dressing table and a large head compartment. There are plenty of lockers for stowage and all have sturdy positive catches to keep them shut. 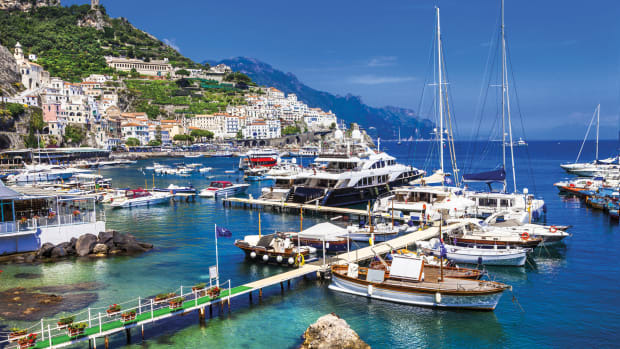 This is luxurious, private cruising for two couples. Other layouts have three or four cabins to accommodate up to eight people. 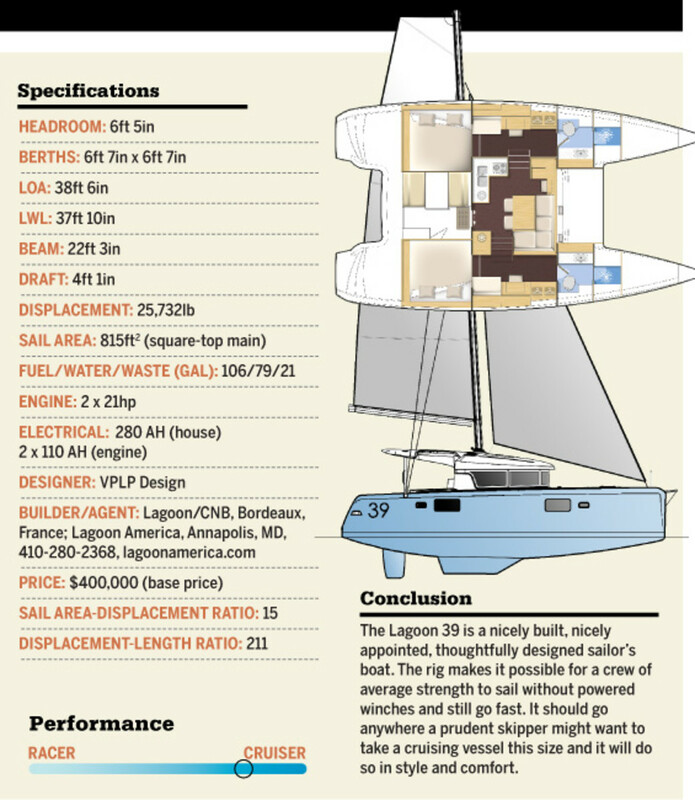 The mast position of the Lagoon 39 results in a very large foretriangle, reminiscent of an ocean racing trimaran. The spar is also tall and supports an efficient, high-aspect mainsail. 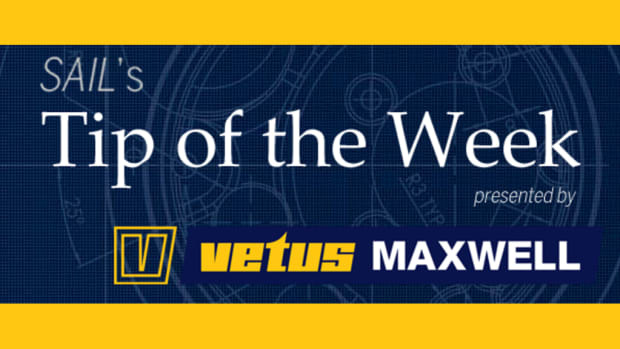 Our test boat had the optional square-top main, which further improves sailing efficiency. 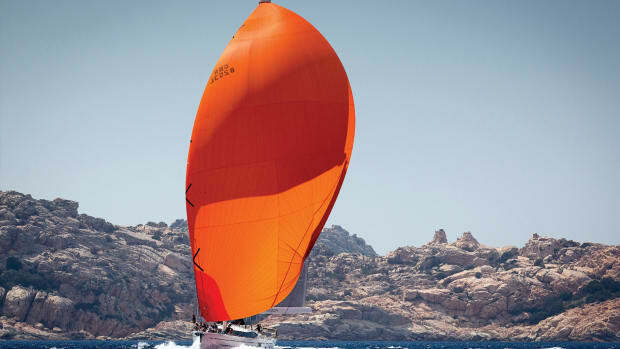 The combination of a large foretriangle and small main means you can choose from a variety of different foresails, including a self-tacking jib. 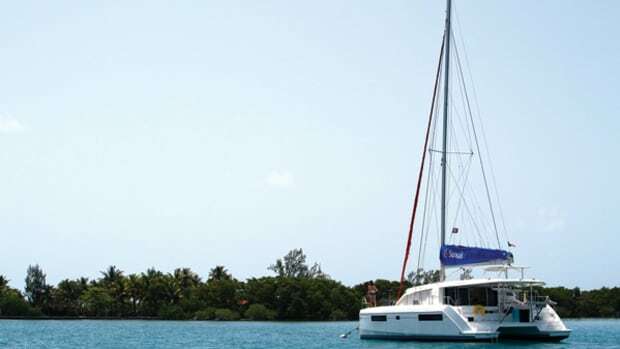 The mainsail is also easier to handle than it is aboard many big multihulls. Some may recall that a superficially similar-looking rig appeared years ago on early Prout catamarans. I gave the boat a good workout out on the open Atlantic off Miami in an 18-knot wind and short, steep 5-7 foot seas. The boat was fast. I noted 7 knots most of the time to windward, with a top speed of about 7.5 knots. Measuring the tacking angle accurately was impossible under the circumstances, but the boat never hesitated to come about or respond to its helm. I was pleasantly surprised to find there was no pounding as the sharp hulls sliced through the waves, although the boat was pretty active with a fair amount of pitching movement. All told, it was a good ride and quite dry, considering the conditions. My impression is that a similar-size monohull would have rolled more and been wetter, but would have pitched less. Which type of motion is better is a matter of personal preference. Nothing smaller than about 100 feet LOA would have ridden easily in the seas we experienced. Off the wind, the 39 accelerated easily to better than 8 knots and raced happily through the waves.  The helm response and feedback were exceptional for a catamaran. The Lagoon 39 feels like a sailboat and is a pleasure to steer. No surprises here: the Lagoon 39 does the “cat pirouette” in its own length with engines running in opposite directions and stops precisely wherever you put it. I measured 7.5 knots at 3,000 rpm with a modest sound level of 68 dBA. Full throttle should drive the boat up to displacement hull speed, around 8.5 knots.